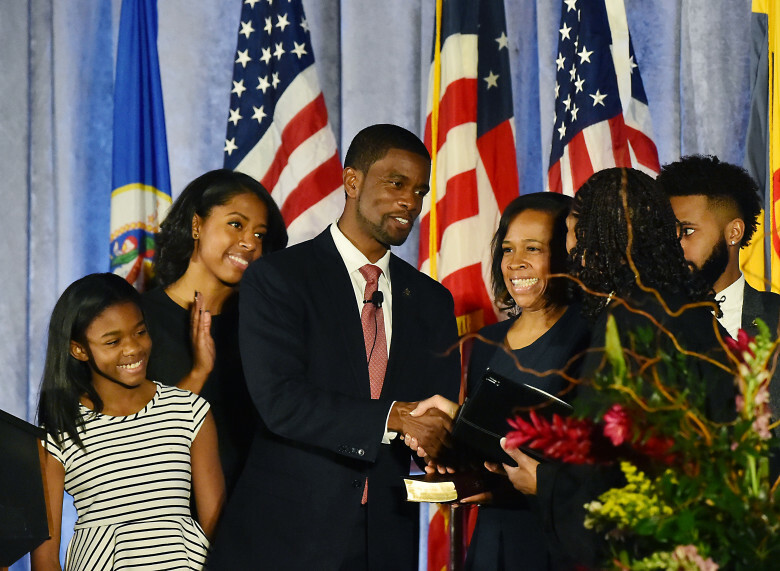 Thirty-eight-year old politician Melvin Carter III was born in 1979 in Saint Paul, Minnesota. He is the first African American to serve as Mayor of the second-largest city in Minnesota. Carter was elected in November 2017 and sworn in on January 2, 2018. During his campaign, he received endorsements from Minnesota Governor Mark Dayton, Senator Al Franken, and the St. Paul Federation of Teachers, among others. He’s married to Sakeena Carter. The couple have five children. Carter’s family has a long-established presence in the Twin Cities since his grandparents, originally from Paris, Texas, decided to flee racial violence and discrimination there in 1900 and settled in Saint Paul. Melvin is the son of Melvin Carter, Jr., a Saint Paul police officer and teacher, Toni Carter, who also served as a Ramsey County Commissioner. He was educated in a Saint Paul public school and then earned a Bachelor’s Degree in business administration from Florida A&M University. He also received a Master’s Degree in Public Policy from the University of Minnesota. Carter was a St. Paul City Council member from 2008 to 2013. He was the representative for the city’s Ward 1 and served as vice-chair of the Council. In July 2013, Carter became the Executive Director of the Minnesota Department of Education and as such was a direct adviser to Governor Mark Dayton on early childhood education policy. While working for the Department, he lobbied for the creation of Saint Paul’s Department of Human Rights & Equal Economic Opportunity (HREEO). Apart from his representative commitments, Carter has worked for several organizations including Wellstone Action, a political organization named after the late Minnesota Senator Paul Wellstone, which trains political candidates, political campaign staff, and community organizers. He has also been an adjunct faculty member at University of Minnesota-Duluth where he taughtclasses on campaigns and elections for graduate students. Carter is a member of Alpha Phi Alpha Fraternity. Melvin Carter’s Biography, Melvin Carter for Saint Paul, http://www.melvincarter.org/bio/; “Melvin Carter”, Wellstone, https://www.wellstone.org/about/trainers/melvin-carter; Melo, Frederick, “Melvin Carter elected St. Paul’s first African-American mayor”, Twin Cities Pioneer Press, November 8, 2017, https://www.twincities.com/2017/11/07/melvin-carter-mayor-st-paul-minnesota-first-african-american-elected-pat-harris-dai-thao/.